It always seems like I have too many tasks to get done in a day and not enough time to do them, or I forget about a task that I needed to get done. There are many different to do list apps available that can help get tasks done. Wunderlist is an app that will allow help your conquer all the tasks you have to do and remind you of the tasks you forget about. The Wunderlist app has been out for a while but it has just gotten an update and now is Wunderlist 2 with more features on more devices. 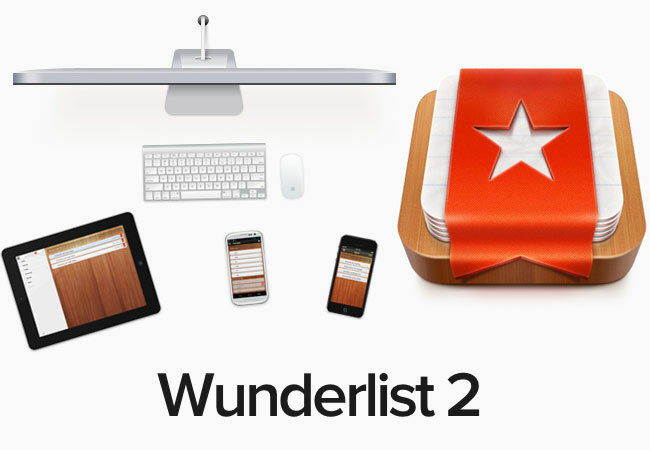 The first thing to say about Wunderlist is that it is a free app on all platforms. 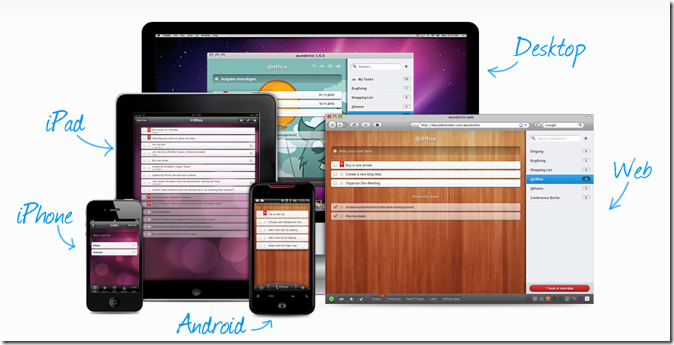 And I am not just talking about Android and iOS, Wunderlist is available on Windows desktop and mobile, Mac, Web, Android, and iOS. What makes it great by being on so many different platforms is you create an account and all your tasks are synced between the devices. So if you create a task on your computer it will be synced to your phone and iPad. Once you setup Wunderlist the first thing you will notice is how good the app looks compared to other to-do lists. 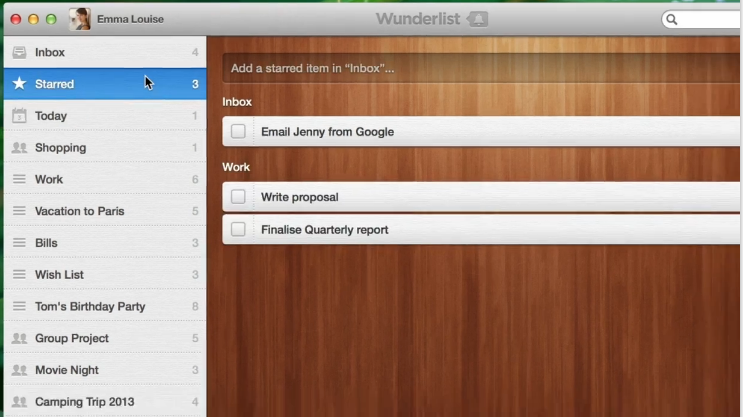 Instead of just having a to-do list on the screen Wunderlist has a great interface with background and animations. Wunderlist uses a unified interface on all platforms so it is easy to switch between devices and still be able to use Wunderlist. The Wunderlist interface is very intuitive and allows you to organize your tasks based on the subject or what tasks are related. In Wunderlist you can customize what you see in the sidebar which can will allow you to see what you have completed or only tasks that are due this week. 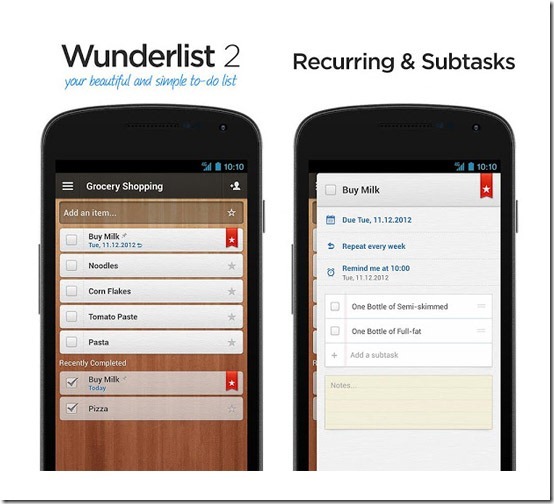 Wunderlist uses Smart List which are on the sidebar and allow you to find tasks quickly and easily. Each task list will show the number of tasks it contains. When you star a task it is added to a list called Starred on the sidebar which allows you to view the task that are important. You can also create subtasks which are very helpful if you have large tasks to complete that have multiple steps. When you create a task you can setup reminders which will notify you that a task is due and you can choose to have the notification sent to you by email or have a push notification on your phone or tablet. This is a really nice feature to have especially if you are like me and tend to forget about a task. You can also setup the task to be reoccurring for the tasks that need to be repeated. Wunderlist has several other very cool features with the new versions of it’s app. First is the integration of social into the app, which allows you to connect with Facebook as well as invite friends through email to join Wunderlist. Once they are on Wunderlist you can start sharing and collaborating with them on the tasks and lists you have created. This is great for group projects and party planning so you can list what each person in the group needs to do and then update the group when you have completed a task. Another cool feature in Wunderlist is the ability to print out your to-do list and tasks if you are the type of person who wants to have there list on paper this feature will let you do it. Overall I think that Wunderlist is a must have app on all your platforms. Not only is it a very handy app that will help you get things done but the app looks great and has many helpful features. 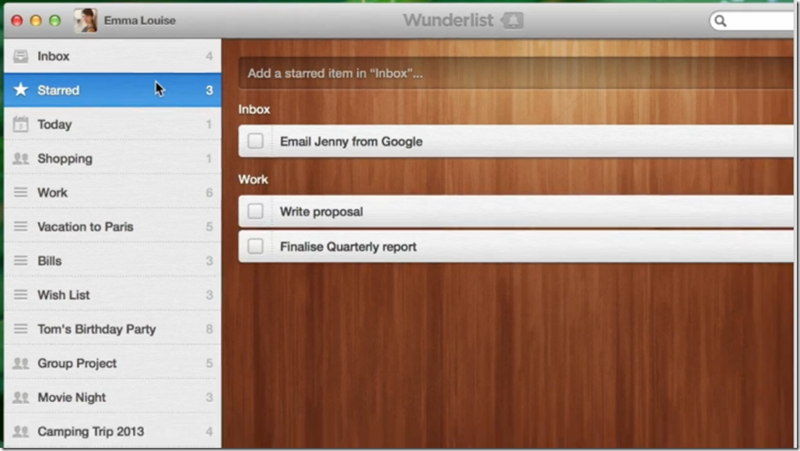 If you do not have the need for a to-do list app then Wunderlist is an app you can skip. But if you like the idea of a to-do app that will help keep you on track with your tasks then I think Wunderlist with all the features that come with is the best app on all platforms. Do you use a to-do app and if so how do you like it?